Today was a pretty ideal zero. My last zero of the Hayduke and I had A LOT of details to tend to. I stayed up late last night til midnight (when the wifi was running speedy and everyone was asleep) getting the blog updated and in the order I deem acceptable…It still kills me that the photos are not coming through at higher resolution with the BlogTouchPro app I have, but it is the best option I have. Blogger just has a way of preventing photos on apps from going up at full resolution. The other app I’ve used, BlogPress also doesn’t post photos to full resolution, but does have a way that I can fix it in the html on a computer….which I rarely get to on the Hayduke. I know I’ve brought this up before, but it is something that is still being worked on and I hope to find a fix before the Great Divide Trail. Here I am with Li’s laptop. THANK YOU LI!!! Speaking of the GDT, I now have my plans for the next four months figured out. Lots of logistics and not my favorite thing to do all these details, but I’m relieved to have it all falling into place so seamlessly. Here’s the game plan…it will be quite the ride, so hold on as I will blog the trip stuff daily! **Possibly do some more hiking in Zion if I get lucky with Subway/Narrows permits. May 25th-June 2nd: Rest up and visit family/friends in the Bay Area. My mom and younger sister live there. 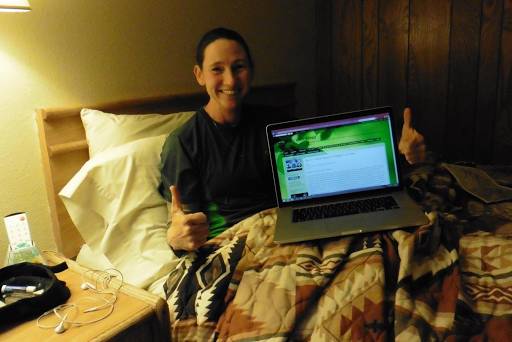 I haven’t seen my mom (other than Skype) since she visited in Yosemite on my PCT hike in 2011! June 3rd-10th: The Tahoe Rim Trail (179mi) with my good friend Rockin! June 18th-June 25th: Take a week in Portland to chill out, see friends, and get my resupplies done for the rest of the summer on the Great Divide Trail. June 26th-29th: Visit my brother, sis-in-law, and nephews in Bozeman, MT. June 30th-July 5th: A 100mi stretch of the CDT in the Bob Marshall Wilderness that was closed to fire my CDT year and I had to take an alternate around the well known Chinese Wall. I’ll be hiking with fellow 2013 CDTer “E” who I briefly overlapped with. Click here to read about our quality time at a CDT water source. I will expand more on the evolution of this pairing as the hike nears. July 7th-end of August: Great Divide Trail ~750mi. Also, planning to hike this trail with “E”! Excited for the two of us to hike together! End of August: Hopefully make it to Chicago in time for the birth of my twin sister’s third little boy! He better not be like his aunt Erin and try to finish things ahead of schedule! Whew! How’s that for a summer!? Yeah, it does feel good to have this all pretty nailed down. I think the planning is the most difficult part and now I can’t wait to execute it! The rest of today was spent clearing out my email inbox, prepping my 10 day resupply, sewing my pants button a notch to the right (my pants won’t stay up), catching up on phone calls, and I finally got to watch THE EPISODE of Greys…oh man! I’m still not caught up to the most current episode, but dang…what a gut punch! In addition to all that, Gavin and I went over to Li’s and had a home cooked meal along with Katherine. Katherine has decided to take a different alternate route now that we are overlapping again so she can continue her solo experience without interruption from other Haydukers. It’s a challenging alternate that just a few have completed (not sure of any in the direction she’s headed) and goes by the name “Three Days of Terror.” Yes, she’d rather hike a trail by that name than leap frog with us, but I totally get it and hope that she finds what she’s seeking out there. Excited to see the posts! Dinner at Li’s was great(forgot to get a photo). Thanks to Li for being an awesome person! Such a wonderful host and giving person. His giving spirit extends well beyond his map sets and he has that quality I greatly admire in the hiking community. Someone who gives back to the hiking community for no ulterior motive other than paying it forward for other hikers the way others have done for him…yep, mad respect for all the time and effort he puts into helping other hikers and creating great map sets all for free. Heck, his data is more updated and helpful than the bundles others charge for! I’ll also be using some of his tracks and info for the GDT at the end of the summer. As if that wasn’t enough, in the small world of hiking, other hikers were in town! Wyoming(first solo gal on Hayduke!) and Freebird made it into town and we saw them at the General Store. They will be just one day behind us so maybe we will see each other again. Yay for our Hayduke herd! The other hikers in town were Arizona Trail hikers. 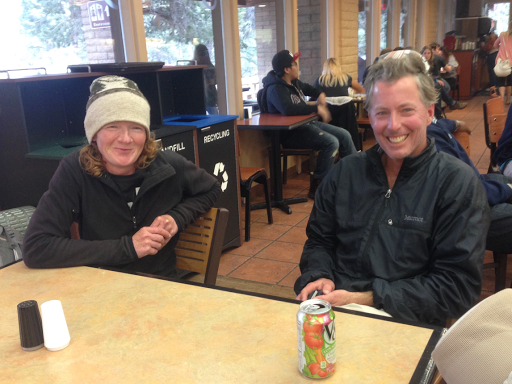 A fellow Gossamer Gear Ambassador that I’ve been wanting to meet, Sirena Dufault, was in town. She is the Gateway Community Liaison for the Arizona Trail Association and was in town with the Warrior Hike participants hiking the AZT. I’ve mentioned this before, but the Warrior Hike program is a great program that sponsors veterans “hiking off the war” on all the major trails. 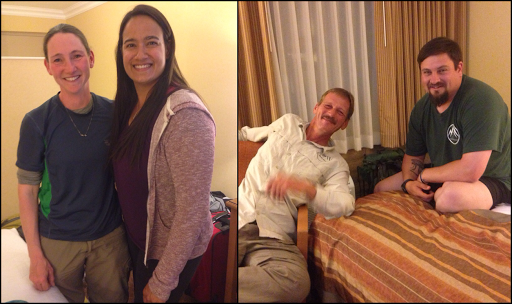 It was great to meet Greyhound and Joshua who will be finishing the AZT in about a week and Sirena will hike the last day with them. The brief time to meet Sirena was great as we’ve had mutual acquaintances and had yet to meet. Just wish there was more time in the day to interact more. She’s done some great things to promote and encourage support of the AZT and it was great to meet her. Whew, quite the day, and again, a zero that was jam packed. Now, time to HIKE!